"Physical Science" redirects here. It is not to be confused with Physics. A branch of natural science – natural science is a major branch of science that tries to explain and predict nature's phenomena, based on empirical evidence. In natural science, hypotheses must be verified scientifically to be regarded as scientific theory. Validity, accuracy, and social mechanisms ensuring quality control, such as peer review and repeatability of findings, are amongst the criteria and methods used for this purpose. Natural science can be broken into two main branches: life science (for example biology) and physical science. 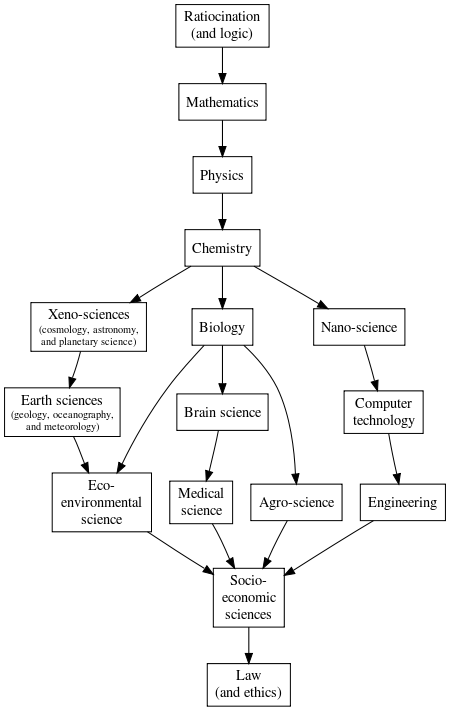 Each of these branches, and all of their sub-branches, are referred to as natural sciences. Earth science – all-embracing term referring to the fields of science dealing with planet Earth. Earth science is the study of how the natural environment (ecosphere or Earth system) works and how it evolved to its current state. It includes the study of the atmosphere, hydrosphere, lithosphere, and biosphere. History of astronomy – history of the study of the universe beyond Earth, including its formation and development, and the evolution, physics, chemistry, meteorology, and motion of celestial objects (such as galaxies, planets, etc.) and phenomena that originate outside the atmosphere of Earth (such as the cosmic background radiation). History of astrodynamics – history of the application of ballistics and celestial mechanics to the practical problems concerning the motion of rockets and other spacecraft. History of astrometry – history of the branch of astronomy that involves precise measurements of the positions and movements of stars and other celestial bodies. History of cosmology – history of the discipline that deals with the nature of the Universe as a whole. History of galactic astronomy – history of the study of our own Milky Way galaxy and all its contents. History of physical cosmology – history of the study of the largest-scale structures and dynamics of the universe and is concerned with fundamental questions about its formation and evolution. History of planetary science – history of the scientific study of planets (including Earth), moons, and planetary systems, in particular those of the Solar System and the processes that form them. History of medical physics – history of the application of physics concepts, theories and methods to medicine. History of neurophysics – history of the branch of biophysics dealing with the nervous system. History of computational physics – history of the study and implementation of numerical algorithms to solve problems in physics for which a quantitative theory already exists. History of condensed matter physics – history of the study of the physical properties of condensed phases of matter. History of cryogenics – history of the cryogenics is the study of the production of very low temperature (below −150 °C, −238 °F or 123K) and the behavior of materials at those temperatures. History of electromagnetism – history of the branch of science concerned with the forces that occur between electrically charged particles. History of materials physics – history of the use of physics to describe materials in many different ways such as force, heat, light and mechanics. History of mathematical physics – history of the application of mathematics to problems in physics and the development of mathematical methods for such applications and for the formulation of physical theories. History of biomechanics – history of the study of the structure and function of biological systems such as humans, animals, plants, organs, and cells by means of the methods of mechanics. History of classical mechanics – history of the one of the two major sub-fields of mechanics, which is concerned with the set of physical laws describing the motion of bodies under the action of a system of forces. History of continuum mechanics – history of the branch of mechanics that deals with the analysis of the kinematics and the mechanical behavior of materials modeled as a continuous mass rather than as discrete particles. History of fluid mechanics – history of the study of fluids and the forces on them. History of quantum mechanics – history of the branch of physics dealing with physical phenomena where the action is on the order of the Planck constant. History of nuclear physics – history of the field of physics that studies the building blocks and interactions of atomic nuclei. History of optics – history of the branch of physics which involves the behavior and properties of light, including its interactions with matter and the construction of instruments that use or detect it. History of particle physics – history of the branch of physics that studies the existence and interactions of particles that are the constituents of what is usually referred to as matter or radiation. History of psychophysics – history of the quantitatively investigates the relationship between physical stimuli and the sensations and perceptions they affect. History of plasma physics – history of the state of matter similar to gas in which a certain portion of the particles are ionized. History of polymer physics – history of the field of physics that studies polymers, their fluctuations, mechanical properties, as well as the kinetics of reactions involving degradation and polymerisation of polymers and monomers respectively. History of quantum physics – history of the branch of physics dealing with physical phenomena where the action is on the order of the Planck constant. History of statics – history of the branch of mechanics concerned with the analysis of loads (force, torque/moment) on physical systems in static equilibrium, that is, in a state where the relative positions of subsystems do not vary over time, or where components and structures are at a constant velocity. History of solid state physics – history of the study of rigid matter, or solids, through methods such as quantum mechanics, crystallography, electromagnetism, and metallurgy. History of vehicle dynamics – history of the dynamics of vehicles, here assumed to be ground vehicles. History of earth science – history of the all-embracing term for the sciences related to the planet Earth. Earth science, and all of its branches, are branches of physical science. Energy conservation, conversion, and transfer. Origins of the universe. Physical science uses the Big Bang theory as the commonly accepted scientific theory of the origin of the universe. A heliocentric Solar System. Ancient cultures saw the Earth as the centre of the Solar System or universe (geocentrism). In the 16th century, Nicolaus Copernicus advanced the ideas of heliocentrism, recognizing the Sun as the centre of the Solar System. Chemistry – branch of science that studies the composition, structure, properties and change of matter. Chemistry is chiefly concerned with atoms and molecules and their interactions and transformations, for example, the properties of the chemical bonds formed between atoms to create chemical compounds. As such, chemistry studies the involvement of electrons and various forms of energy in photochemical reactions, oxidation-reduction reactions, changes in phases of matter, and separation of mixtures. Preparation and properties of complex substances, such as alloys, polymers, biological molecules, and pharmaceutical agents are considered in specialized fields of chemistry. ^ a b "What is Chemistry?". Chemweb.ucc.ie. Retrieved 2011-06-12. ^ a b Chemistry. (n.d.). Merriam-Webster's Medical Dictionary. Retrieved August 19, 2007. ^ Scharringhausen, Britt. "What's the difference between astronomy and astrology? (Beginner) – Curious About Astronomy? Ask an Astronomer". curious.astro.cornell.edu. Retrieved 2017-05-27. ^ "Astronomy vs Astrology". January 2019. ^ "astrology | Origin and meaning of astrology by Online Etymology Dictionary". www.etymonline.com. Retrieved 2017-10-17. Feynman, R.P. ; Leighton, R.B. ; Sands, M. (1963). The Feynman Lectures on Physics. 1. ISBN 0-201-02116-1. Holzner, S. (2006). Physics for Dummies. John Wiley & Sons. ISBN 0-470-61841-8. Physics is the study of your world and universe around you.